Hyundai chose the Paris Auto Show to unveil a prototype of their new generation i20 WRC rally car, which they hope will be a leader in the 2017 World Rally Championship. 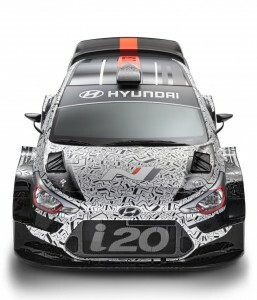 For those of you who may be unaware, this model is based on the current Hyundai i20 3-door hatchback, and the belief is that this model will be much faster than the current WRC cars, thanks in large part to new technical regulation put in place by the FIA. The 2017 WRC season will see manufacturers add 36 mm restrictor plates on their turbochargers, which is a significant jump from the current 33 mm ones being used now. All told, rally fans can expect to see the 1.6L turbocharged engine horsepower ratings increase from around 315 horsepower all the way up to 380 horsepower. In 2017, teams will also be able to get a little more creative with aero parts design, which will help increase downforce. Hyundai have taken advantage of that by making some major body design changes to the 2017 i20 WRC car, which includes an updated front end, flared front and rear wheel arches, a much larger rear wing, and a new diffuser. The i20 WRC prototype displayed in Paris is being described as an interim version, but it still gives us a very good idea of what we can expect from the finished article. Team leader Michael Nandan explained that the focus so far has been to the suspension, differential, and aero. The Hyundai Motorsport team is still hard at work putting in the finishing touches for the 2017 i20 WRC model, with the engine and chassis next up for them. The final version of the new generation Hyundai i20 WRC rally car will be officially unveiled around the New Year, with the first rally of the 2017 WRC season taking place in Monte Carlo (in January 2017.